EmojiOne has today released version 3.0 which includes a complete redesign of every emoji, support for all emojis approved in 2016, and updates to licensing terms. Previously distributed with a Creative Commons license, EmojiOne has moved to a freemium model in this latest release. While this will remain free for many users, some specific features now require a paid license. In total 2,384 emojis are now supported, which means this release provides full support for Emoji 4.0. Above: EmojiOne version 3.0 has a new design for every emoji. 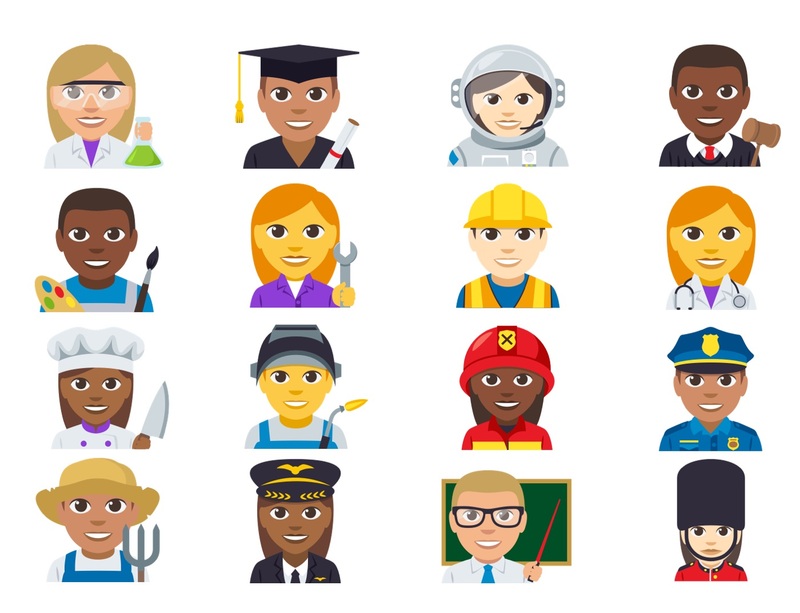 Updates to Emoji 4.0 in 2016 primarily involved genders: most male emojis had female versions added; and most female emojis had a male counterpart added. In addition, 16 new professions were added with each having a man and woman represented in the role. These are all present in the latest EmojiOne release. Above: New professions are available in this release. Image: EmojiOne. Every emoji has seen a graphical update in this release. Smileys have a glossier appearance when compared to previous designs, and all other emojis have been changed in some way or another. "we've worked to keep our emoji more in line with what you'll see from Apple, Google, and Windows. You'll see greater consistency in style and implied meaning, making communication that much clearer." These can be seen across the board, with most faces now closer to the intention of other vendors, or symbols using colors and shapes generally in use elsewhere. 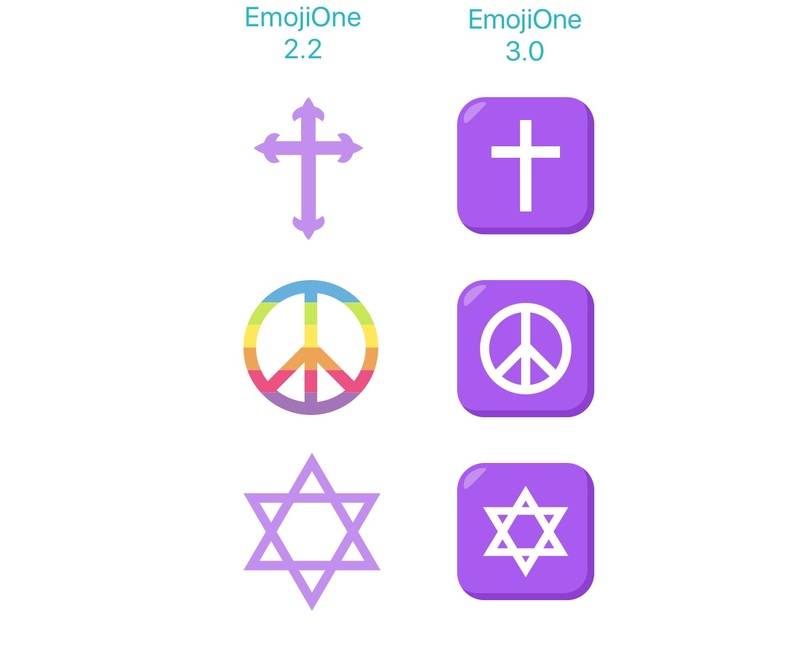 Above: ✝️☮️✡️ are closer in appearance to iOS in this release. Image: EmojiOne. Not all changes nod toward Apple. For instance, 😵 Dizzy Face has moved to spiral-eyed appearance which is clearer in western countries, and used by Google and Microsoft. Other design updates may not serve a particular purpose, but do help keep the set consistent with itself. View every emoji in this set or view the post from EmojiOne covering these updates in more detail. Above: No emoji was left untouched in this release. Past releases of EmojiOne have been free, with attribution. A free option remains in version 3.0, but this is limited to a specific range of project types. "Although free is great, unfortunately, free doesn’t pay the design, coding, and server bills (let alone the pizza and electricity bills at home!). Some changes were necessary." The free tier allows using EmojiOne for personal use, on the web, or as an option in apps. Using EmojiOne in print or commercial advertising requires the paid premium option which also grants access to higher resolution images. It should be noted EmojiOne could be the most revised emoji set, with almost every emoji now containing three distinct versions! Browse emoji history on Emojipedia by tapping any emoji image. Above: 👹 Japanese Ogre is on its fourth revision in EmojiOne 3.0. EmojiOne 3.0 is now available, and can be found using any of the links below.